Over the weekend one of my BFFs came over to Hong Kong for a visit. I left the planning to her, and to my surprise she wanted to visit Lantau Island, a place I had always vowed to go but never did. Lantau is a Cantonese word that means “broken head”, but Chinese call Hong Kong’s largest island Tai Yue San (Big Island Mountain), a name that refers both to its size and elevation. Our original plan was to visit the island at noon, but due to some mishap (a distressing combination of failed telco connection, excessive shopping, late sleep in and general miscommunication), we spent hours trying to get our troop together, during which Cheryl was evidently getting more and more anxious by the minute. 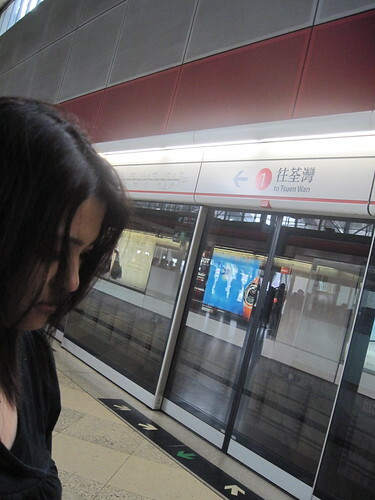 Nevertheless yours truly managed to elicit a smile from her for the camera, even while she was frantically trying to reach out to her travelmates at the end point of the MTR line, at the Tung Chung station. 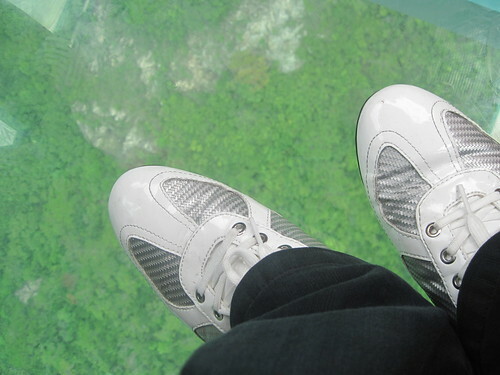 This is the point where we were to board the cable car up to the peak of Lantau Island. 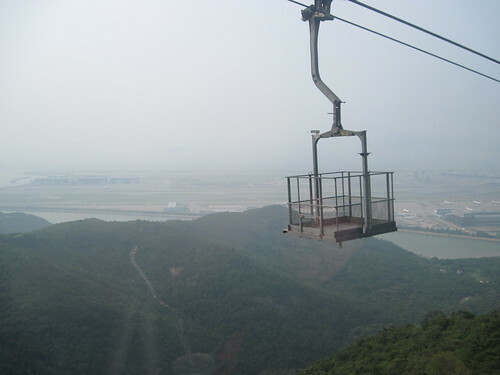 The 5.7 km Ngong Ping 360 is a cable car system linking Ngong Ping with the centre of Tung Chung, where the MTR station is located at. The two of us bought the most expensive package, which include a return trip in a crystal cabin and entry to some shoes at Ngong Ping. So, what is a crystal cabin? You got it right – it’s a glass-bottomed cabin! Those close to me will know I am terrified by heights, so it was a downright reckless decision for me to even consider boarding this cabin. But board I did, and to be honest, the ride up wasn’t as terrifying as the ride down. The floor cabin felt fake somehow, like a large LCD display. The scenery on the way up was amazing. 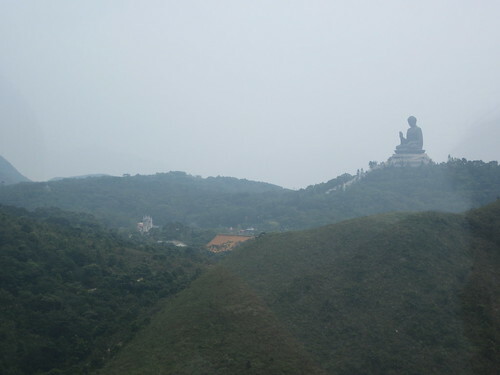 We saw the famous Lantau Trail, which takes hours to hike from the Ngong Ping plateau to the peak of Ngong Ping Village. Every now and then we also saw some lone tombs (perhaps of famous people) which were reasonably well kept. They made me wonder, how on earth the relatives of the deceased come to visit every year? There was no visible trail, no flat ground for helipad of any sort… that remains a mystery to us. 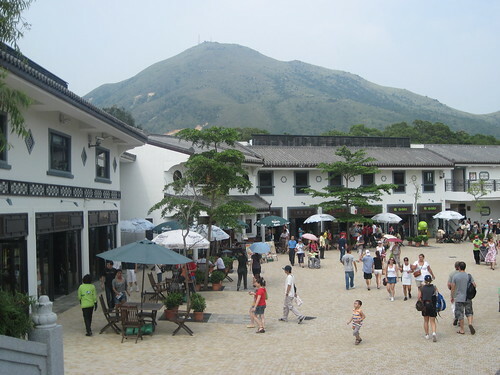 Finally we reached the upper cable car station is the 1.5-hectare Ngong Ping Village, just west of the Po Lin Monastery complex (under renovation during our visit) and includes several themed attractions; Walking with Buddha and the Monkey’s Tale Theatre. These were included in our package but due to the short time we had for the trip, we couldn’t make it for either shows. 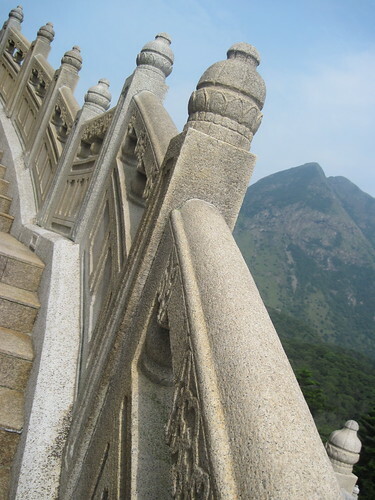 To be honest, I found that Ngong Ping Village is a perplexing mix of Chinese architecture with Western modernity. Although the buildings were definitely oriental, the shops are not. You get to see some Western cafe, popcorn stall, even a Starbucks. Which kind of a bummer for those looking for an authentic Chinese experience, especially with the gigantic Buddha statue nearby. 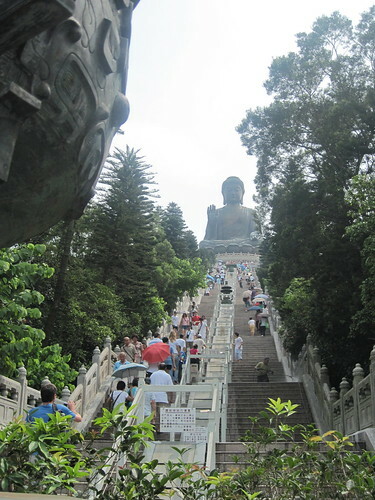 On the hill above the monastery sits the Tian Tan Buddha, a seated representation of Lord Gautama some 23 m high (or 26.4m with the lotus or just under 34 m if you include the podium). There are bigger Buddha status elsewhere, but apparently these are not seated, outdoors or made of bronze. It weighs 202 tonnes, by the way. The large bell within the Buddha (in which you are not allowed to take photos) is controlled by computer and rings 108 times during the day to symbolise escape from what Buddhism terms the ‘108 troubles of mankind’. The podium is composed of separate chambers on three different levels. 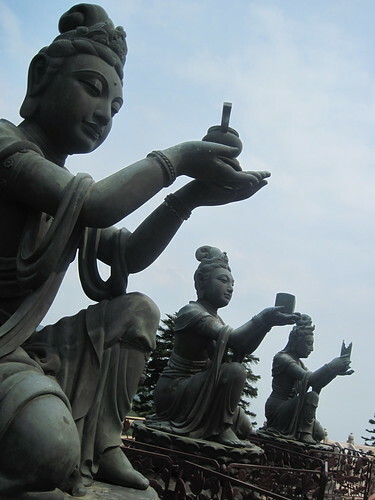 In the first level are the six statues of Bodhisattvas, each of which weights around two tonnes. 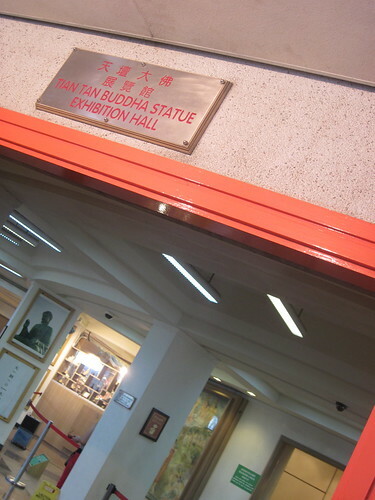 On the second level is a small museum containing oil paintings and ceramic plaques of the Buddha’s life and teachings. No photography is allowed at the museum. 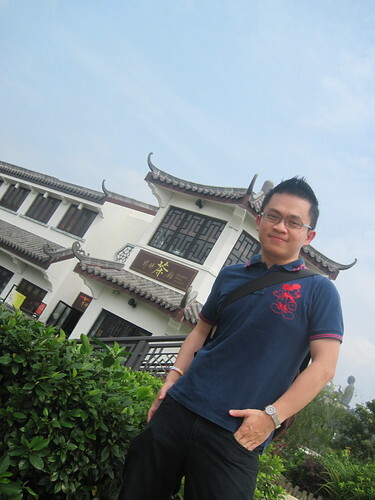 Entry is free if you eat at the monastery’s vegetarian restaurant, Po Lin Vegetarian Restaurant. However, you can also opt for a cheaper ticket which allows you some vegetarian snacks (redeemable at the monastery at the foot of the hill), or exchange it for a bottle of water and an ice cream of your choice. Cheryl and I opted for the later, of course. The weather was scorching hot, and the climb was decidedly arduous. However, it’s well worth climbing the 260 steps for a closer look at the statue and surrounding views, which was breathtaking for city dwellers like us. After such an exhausting hike, Cheryl and I made our way down the hill and made a beeline to Ngong Ping Tea House for some authentic tea cultural experience, of which we were not disappointed. Okay, not to say I am not a cultured person, but I do think one has to go through a lot of trouble just for a tiny cup of tea. Like Cheryl said, we should have culture with convenience. LOL. That marks the end of our excursion to Lantau. How much did I spend? Well, we spent about HKD290 for the cable car package, about HKD50 for entry to the Tian Tan Buddha exhibition hall, and another HKD100 for the experience at tea house. … I am joking of course. The said “cabin” is probably for some maintenance work, but it cracked us up nonetheless. Click here for the full set of photos of Cheryl’s trip to Hong Kong. Hope you had a blast, girl… and thanks for listening to my endless problems. I told you, your turn will come! Hehe. Wow! very nice blog. 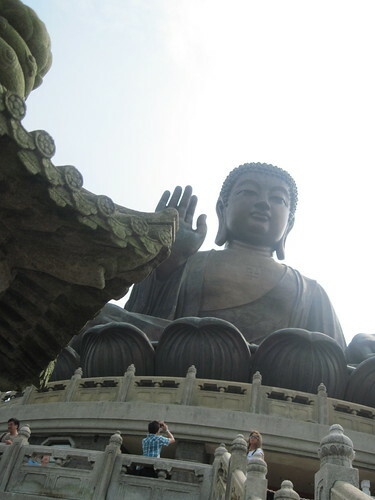 Thank you for sharing your lantau experience. I love it! 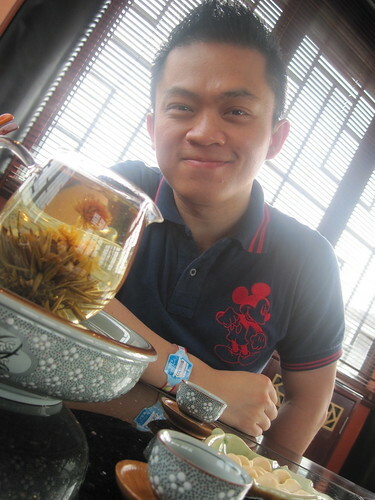 @ Grace – Even though I fancy myself as somewhat a foodie, I don't really know what are the “must not miss” food in HK. But given a choice I will do the seafood either at one of the outlying islands or at Mongkok streetside. Also there is this place called Spring Deer at Tsim Sha Tsui which did some of the best HK dishes I have tasted. 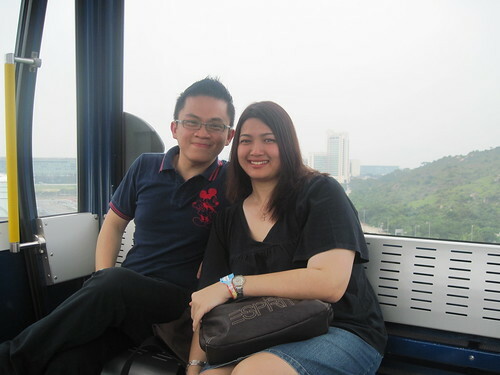 For a touch of luxury and good food and great view and a price to match, head to The Peak Lookout at The Peak. At night, the view is dazzling.